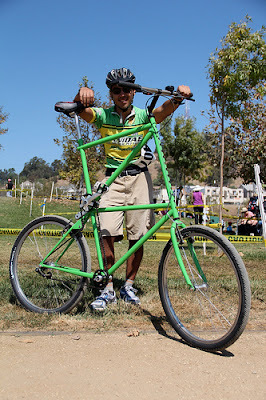 I new I'd find a picture floating around the web with me on my tall bike. I brought it to So Cal Cross DTLA Historical Park CX event. The question is, did you ride that thing around the course. You were actually driving off just as I got there with the family. I didn't put 2 and 2 together in time to realize it was you, until I say this photo. Well I really need to see the entire process of mounting, riding and then safely stopping and dismounting. Just call me a Missourian today. Show me!